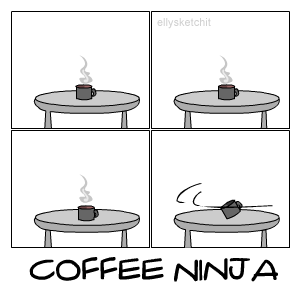 Despite their doubled heads - or perhaps because of it -- the Ninjas have always had to double up on their caffeine intake. This led to an amazing disappearance of all coffee within a five foot radius of Moy Mell Keep one foggy morning after one of the Disco Puvia's parties. No one knew what happened, but coffee cups began vanishing from tables everywhere only to return with a ring around the top (and in instances of paper cups sometimes with a bite mark). It wasn't until Elly noticed her chimera pair jittering across her courtyard that she put two and two together. Ever since then she's always been very careful to provide them with their morning brew but they still pop up unexpectedly in the strangest places!